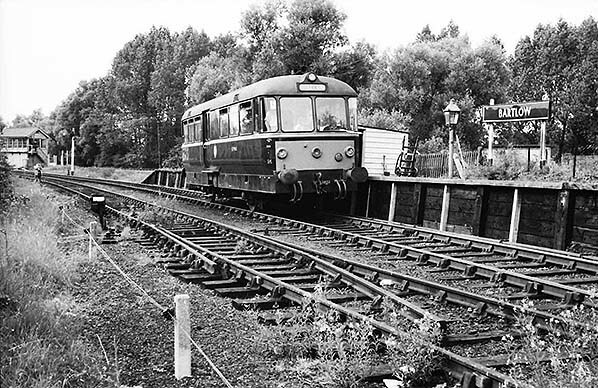 In June 1964 railbus E79963 waits at Bartlow branch platform before returning to Audley End. This photograph is fairly well known and the train in the background, on the Stour Valley line, is stated as being bound for Marks Tey. However, under magnification, just to the right of the far end of the railbus what looks very much like the short bonnet end of a BTH Type 1 (Class 15) locomotive can be seen. If so, the train is heading for Cambridge and not Marks Tey. Either way, the BTH Type 1 locomotives were common on the Stour Valley line and could be seen on passenger trains during the warmer months when train heating was not required. Apart from the Clacton - Leicester through trains, which had been around since steam days, there was a diesel locomotive hauled local passenger train during the afternoon. Usually this was formed of two or three passenger coaches and a couple of parcels vans or a full brake, with motive power being either a Brush Type 2 or a BTH Type 1. The Bartlow branch platform appears to be the centre of attention on this occasion. There are some eager-looking passengers on the railbus and at least two people, including the photographer, taking photographs while the signalman watches from the top of the signal box steps. The railbus is E79961 which, notwithstanding its number being just visible, is identifiable by its large yellow warning panel and overhead warning flash near the top of the curved light. The position of the overhead warning flash tells us that the photograph was taken not long before the branch closed. It is possibly the penultimate day as E79961 is known to have been working the branch that day and it was photographed elsewhere on the branch on the same day until replaced in the evening by E79963. This image provides an opportunity to mention the branch platform at Bartlow, which had subsided back away from the track. The remedy had been to extend the platform edge with timber and to support it with the apparently white posts seen on the right. Only a sufficient length of platform had been so treated, enough for a push-and-pull train or, later, a DMU, and the start of the untreated section, which was effectively abandoned, can just be seen on the far right. 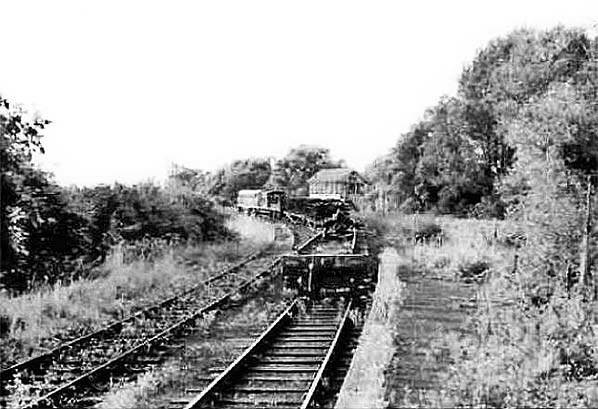 This photograph was possibly taken at the same time as the other view of E79961 at Bartlow. It is certainly during the same period. The post on the left bearing a totem is a little odd. It originally supported a lamp identical to that seen adjacent to the entrance but has had an extension with a hook added. This would have been to hang a lantern or Tilley lamp from although no evidence of either has been seen. In any event, once the little railbuses had taken over the service all that would have been required was the lamp beside the entrance. 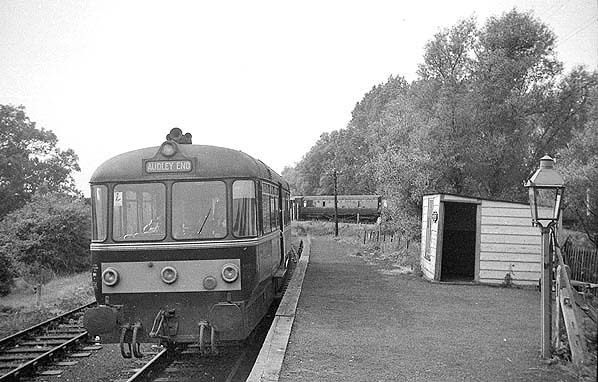 At Bartlow – and, indeed, Ashdon, where passengers waited in the old carriage body - it must have been a strange experience, especially after dark, to wait on an isolated oil-lit cinder platform and then enter the bright, modern, interior of a diesel railbus or, on occasion, a DMU. The waiting shelter appears to have been well maintained until the end. The railbus has its tail lamp in place ready to trundle back to Audley End but the rear destination blind has not been changed. This, as mentioned elsewhere, was common practice. As with rear blinds on road buses, it has often been said that if anyone can see what is displayed on the rear then they have probably missed it anyway. The scene along the Saffron Walden branch just outside Bartlow on 7 December 1968, a few weeks after completion of filming for The Virgin Soldiers. The coaching stock is in the process of being scrapped while Federated Malay States Railways L class No.531.03 awaits the same fate following an abortive preservation attempt. The locomotive is, of course, Stanier Black Five No.44781. For more information see The Virgin Soldiers feature. With Linton and Cambridge behind the camera, Haverhill to the left and Audley End to the right, this is Bartlow Junction on a rainy day in October 1974. The track, on both sides of the station, had been lifted just four years previously. The contrast between the proper station, left, and Saffron Walden branch platform, right, is well illustrated. The signal box remained in the condition seen above for a further 36 years until, by then largely hidden in woods, it collapsed in 2010. It had been intended to provide a turntable at Bartlow for, presumably, Saffron Walden branch locomotives. In February 1867 the GER Way & Works Committee mentioned the turntable as well as inadequate ballasting on the branch and constant problems with landslips and subsidence. 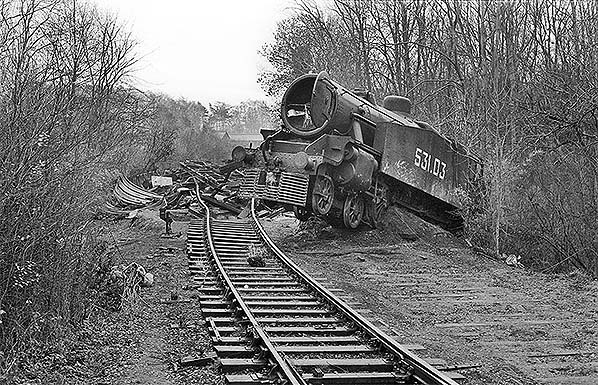 The matters were passed to the Saffron Walden Railway Company and, perhaps unsurprisingly, the turntable was never heard of again. The subsidence problems were to remain with the branch for its entire life. One can only guess at where a turntable at Bartlow might have been located. 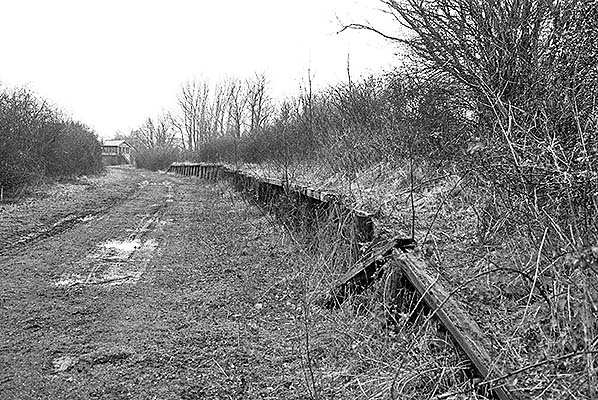 The Bartlow branch platform in 1974 looking towards Saffron Walden. As in other images, the repaired and non-repaired sections of platform are obvious. By this time, and from this angle, it was becoming difficult to discern where the access path was: it was where the area of less dense bushes is, to the right of the centre of the image. Looking along the platform towards the junction in October 1974. Looking along the platform towards the junction in October 1974, this time from adjacent to the access pathway from the main part of the station. 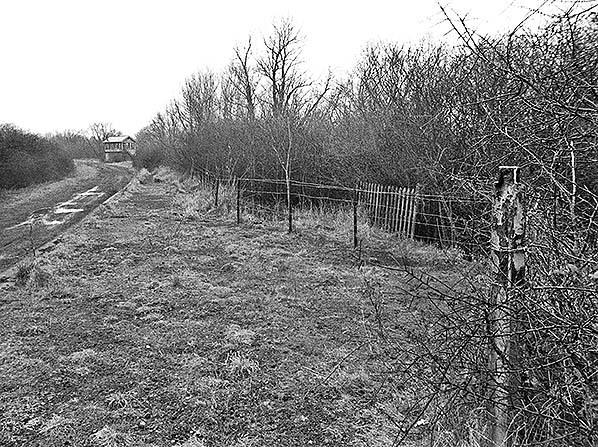 No trace remains of the waiting shelter, which stood directly ahead of the camera and just beyond the wooden fencing seen right of centre. This was the fencing which once bore the oddly-worded sign directing passengers to the main station. The post in the right foreground once supported the oil lamp visible in so many images. One wonders who removed the waiting shelter and why. 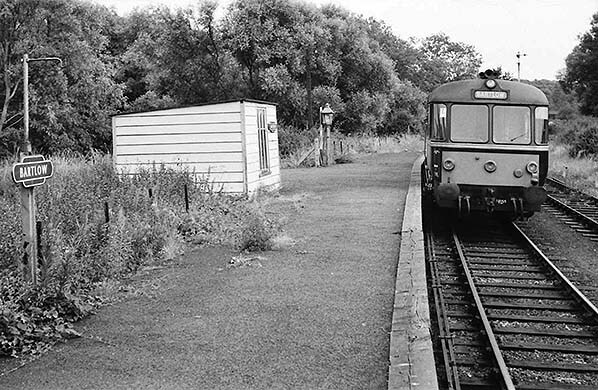 The shelter was still present when the line closed but had gone by the time the track was lifted, at Bartlow, in 1970. BR would have had little or no use for the wooden structure by that time. Perhaps it was chopped up for firewood. An October 1974 view along the path between branch platform and main station, the latter being largely obscured by the tall tree in the background. On the right is the post from which an oil lamp once cast a few lumens over the platform and to its left the relatively modern concrete fence post can be seen. To the left, part of the fencing which once bore the 'Cross the Road' sign can just be made out. The section of this fence remaining in 1974 is off the picture to the left. The fencing alongside the path with thin stanchions was of railway origin. It was widely used on and around the branch platform, can be seen in numerous images and could even have been installed when the line was built. No pictures of Bartlow branch platform are clear enough to judge, but these stanchions often resembled rails as used on small-gauge railways; whether they once were is not known. Some of this fencing has been used to crudely block off the access path. This may have been done to mark a property boundary after BR sold the main station or it may have been done in 1968 when ‘The Virgin Soldiers’ was filmed. During the period of filming the area was cordoned off, including from alongside the Ashdon Road, albeit not very effectively, and the curious had no trouble reaching the site once filming was complete and before the train was scrapped. 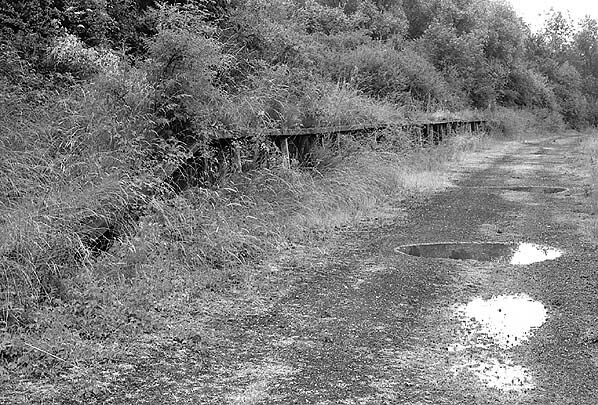 Bartlow branch platform looking towards Ashdon in June 1975. 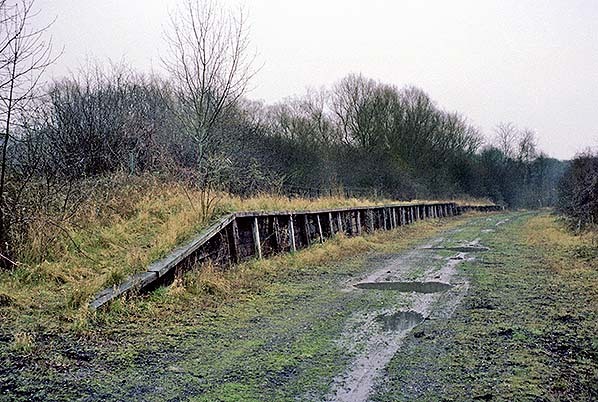 Almost eleven years after closure, but just five years after the track was lifted at this location, nature is rapidly taking over. 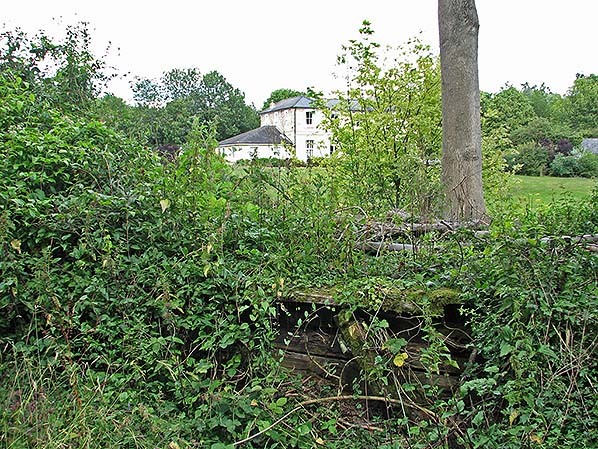 From this viewpoint it is impossible to determine where the entrance was; it was where the lighter clump of undergrowth can be seen about two-thirds of the way along the visible length of platform. 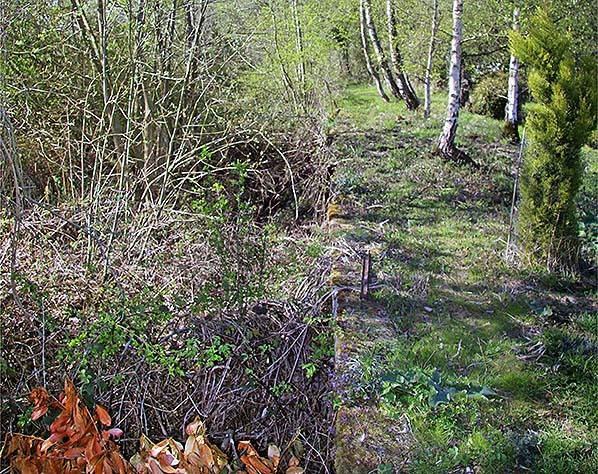 Beyond where the platform disappears completely into the undergrowth in the distance is the section which became disused following makeshift counter-subsidence repairs. 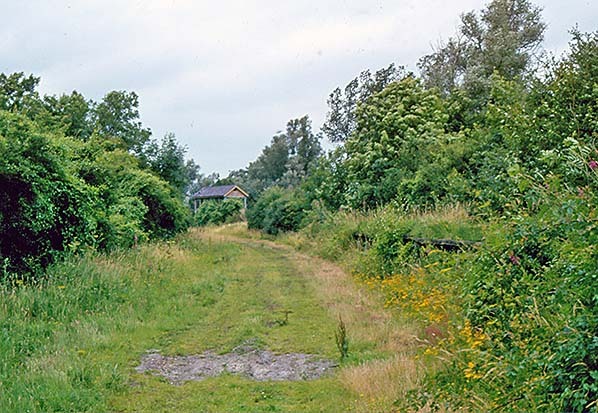 Despite the invasion of undergrowth on the platform, the trackbed remains largely clear. This scenario was quite common at abandoned stations due to decades of oil and ash deposits which, over time, penetrated into the ground. In July 1978 the scene at Bartlow is reminiscent of a pleasant walk along a forest track and, to all intents and purposes, that is precisely what it is. Part of the platform remains visible on the right but it is rapidly becoming engulfed. 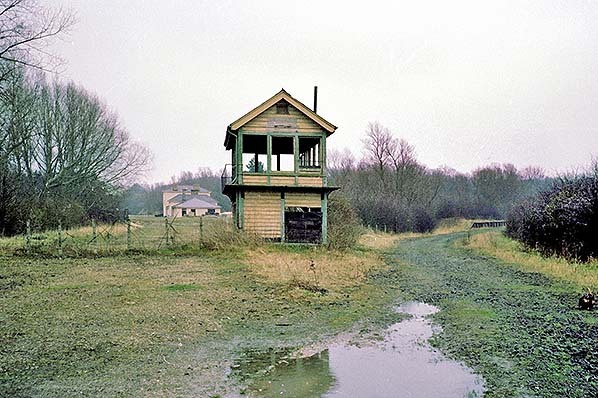 In the background, Bartlow Junction signal box stands as a ghostly reminder of the past. This view is 14 years after the Saffron Walden branch closed, 11 years after the Stour Valley line closed and a mere eight years after the track was finally removed. 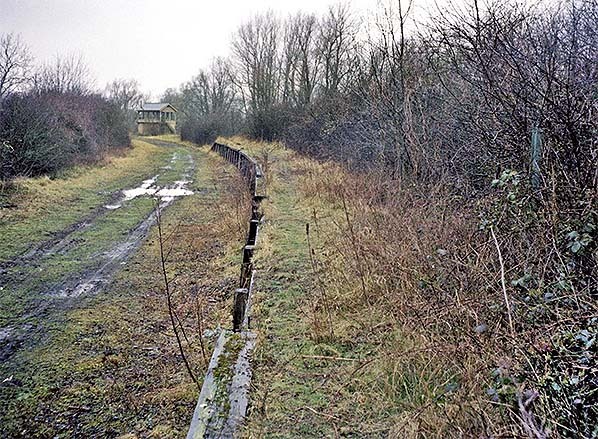 It should be remembered that track-lifting on the Saffron Walden branch took place in 1968 apart from 500-or-so yards at the Bartlow end, which was lifted with the Stour Valley line in 1970. An August 2011 view from the trackbed of the Saffron Walden branch, looking towards Bartlow station building in the background. In the foreground a short length of the branch platform can be seen. What we are looking at appears to be the extant extended platform face as right of centre one of the supports which were added as part of this work. The support has partially collapsed and is leaning towards the left. The camera is directly facing what was once the platform entrance and along what was once the footpath leading to and from the main part of the station. The waiting shelter stood to the left, the actual site being off the image, and where the tree is to the right once stood an oil lamp. 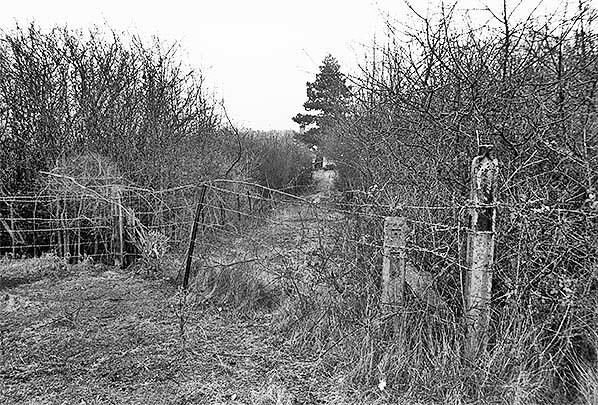 The fence which once bore a sign directing passengers to 'Cross the Road' would have stood behind the heavy undergrowth on the left. The land between branch platform and main part of the station has been grassed and there is no obvious trace of any of the features connected with the branch platform and the footpath. Bartlow branch platform in April 2015. The view is towards the junction. The trackbed was on the left and the platform curves to the left in the distance, although the latter is not readily apparent in this view. The photographer informs us he was standing at the Saffron Walden end of the platform so, taking this literally, the section of platform edge visible above is the original. As described elsewhere, the branch platform subsided away from the track and part of the platform received an extended edge supported by wooden props. About one third of the platform, at the Saffron Walden end, was not so treated and thus became disused. This will be the section of platform seen above. When this work was undertaken is not clear but photographic evidence tells us that it was around the time that push-and-pull working was introduced in 1951. This makes sense as the push-and-pull trains were fixed two-coach formations, with the original driving trailers being narrow-bodied, and they would not have required the full length of the platform. The item of ironmongery lying on the platform cannot be identified. It may be the post which supported an oil lamp at this end of the platform but its cross-section appears to be rather too thin for that. The birch trees appear to be recent arrivals at Bartlow as none are apparent in other post-closure views.